New with vitamin K2 and green tea extract. 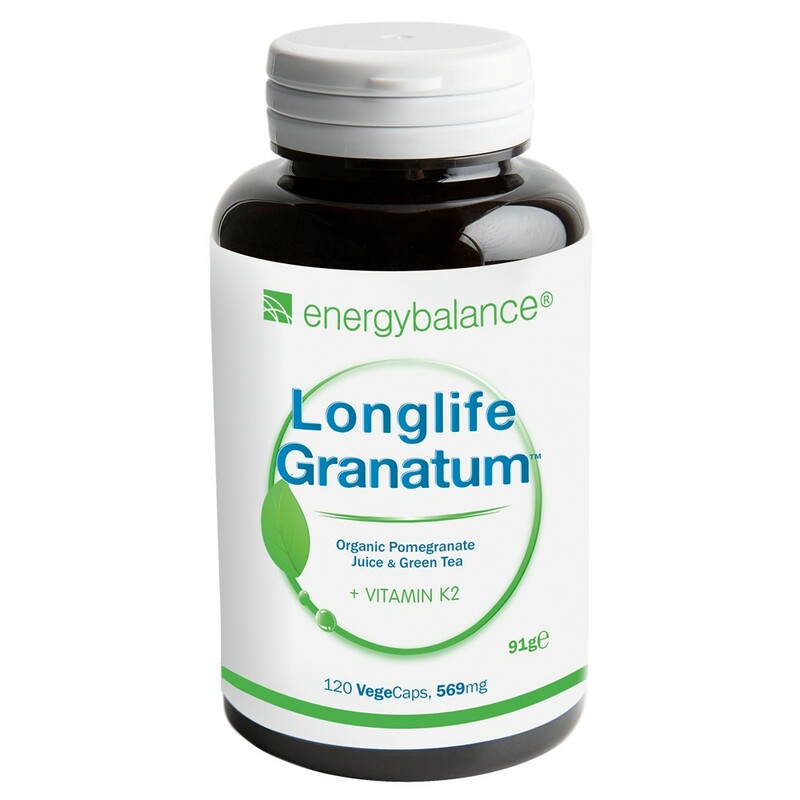 Longlife Granatum™ is made from organic pomegranate juice extract and highly-concentrated pomegranate extracts and the highest-quality vitamin K2 currently available. Pomegranates and green tea contain the important ingredient antioxidant polyphenols, also referred to as phytochemicals. These special phytochemicals give pomegranates their unique aroma and effect. With vitamin K2 as microencapsulated MK7 with 100% biologically-active all-trans isomers. One 569mg capsule contains 253mg of polyphenol. Contents: 120 vegecaps of 569mg each. One package lasts for at least 30 days. The pomegranate is also referred to as "punica granatum"?in Latin. It is one of the oldest fruits eaten and used by people for medicinal purposes. Research on the pomegranate really began around seven years ago. Since then more than 200 papers have been published. Pomegranate juice has been proven to have conclusive antioxidant effects in clinical studies in vitro and in vivo. The latest research indicates that pomegranate polyphenols can also be used to prevent a number of common health problems. Vitamin K2 has gained scientific importance and is referred to as menaquinone in English. Vitamin K2 has recently been called the new miracle vitamin. Different studies confirm promising and interesting results. The liposoluble vitamin K, also called menaquinone MK, is known to be an essential nutrient for combating blood clotting, as the synthesis of different blood clotting factors is dependent on vitamin K. A vitamin K deficiency can lead to haemorrhaging. The letter ‘K’ stands for the German word ‘Koagulation’, meaning coagulation or clotting. 120 capsules of 569mg each.